Last weekend was truly the first great weekend for some yard work here in Colorado. We checked the extended forecast and it doesn’t look like we will have another freeze. So we were excited to start working on our Summer yard! Thanks to my family I received gift cards for my Birthday to help with the yard and first off we got a new fence for the garden! It looks so cute and we think it will do a good job of keeping our silly boys out of the garden! We did plant flowers, flower seeds and herbs but I am waiting on my heirloom garden seeds to arrive! I got these super awesome galvanized planters at Home Goods and they fit in perfectly! My sister and her husband got me these awesome patio lights for my Birthday, you can’t really see it but the string is braided red and white! It’s so fun! We cleaned off all the cushions and put together the upstairs patio and we were able to have dinner that night outside! We are waiting on a neat outdoor prep table to go by the grill, I am excited about that! The front patio is all fixed up too! This weekend I am out of town but hopefully Matt will mow and do the mulch in the yard so next weekend we can plant the garden and be DONE! We had a belated Cinco De Mayo Saturday! We have Mexican Burgers and Margaritas! Yumm! That night before bed I realized THIS HAPPENED! 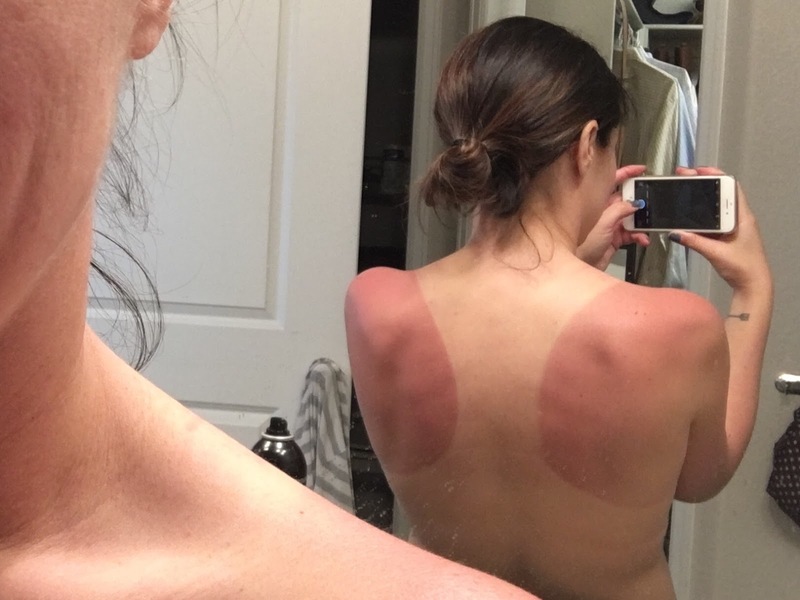 We are so stupid and didn’t put on sunscreen but I guess we thought that since it wasn’t really hot the summer sun wasn’t in full force BUT clearly we were wrong! I know, It’s BAD! Sunday we went to brunch at our favorite place Snooze and then went to see Guardians of the Galaxy 2! Of course we LOVED it and I need a BABY GROOT so bad! Like really bad, Baby Groot makes the whole movie! How was your weekend? I head out tomorrow for St. Louis with my family because my brother graduates from Medical School!!! Check my social media for pics of the trip!